This weekend a lot of people will be pulling out their preppiest clothes, large hats, and sipping on mint juleps. A few years ago, I was going to go out while the race was going on to drink and bet. I decided it would be better that day to stay at home, make food and watch Legally Blonde. I texted my family my winner for the horse race. Lo and behold, my horse won. I was so mad because I originally planned to go out and bet at some bar to win at like $50? $100? $1000? I chose Legally Blonde & cauliflower soup or something weird like that. Needless to say, I never fully participate in the derby festivities. I have, however, had a mint julep. And I wasn’t the biggest fan. Probably because I don’t like bourbon. Maybe I just haven’t tried a good one yet, so in the meantime I will drink other fancy drinks such as this mojito. Last weekend some people came over for some drinks & I wanted to make something to sip on that was pretty. 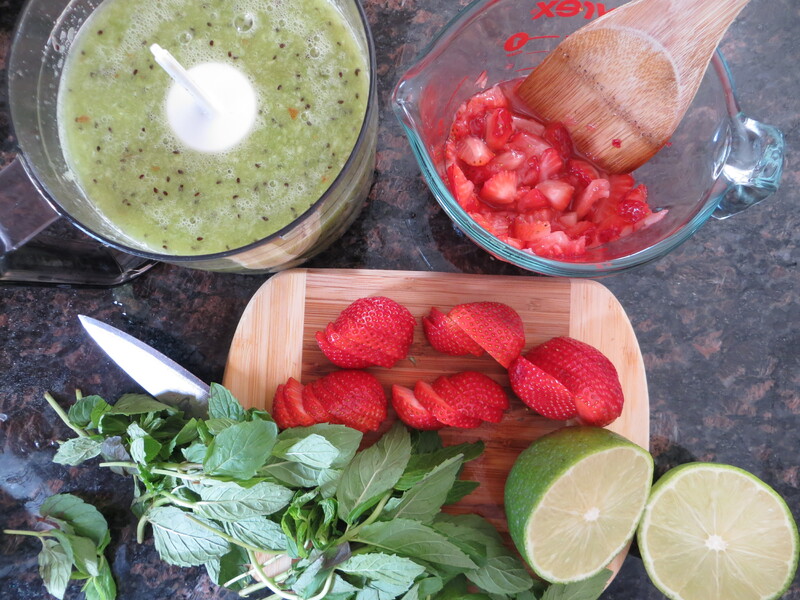 I love mojitos and contemplated a basic one, but I thought an added flavor twist would make it interesting. I chose strawberries & kiwis. The drink was very tasty. But there were some tweeks made after a few sips/drinks in order to make the drink better. I pureed the kiwis and a bit of the strawberries in an attempt to make a fruit puree. However, it ended up just separating, the kiwi seeds floating to the bottom, and a clogged straw. I am sharing the altered recipe in order to avoid these flaws. Feel free to use only one of the fruits if you prefer. 1. 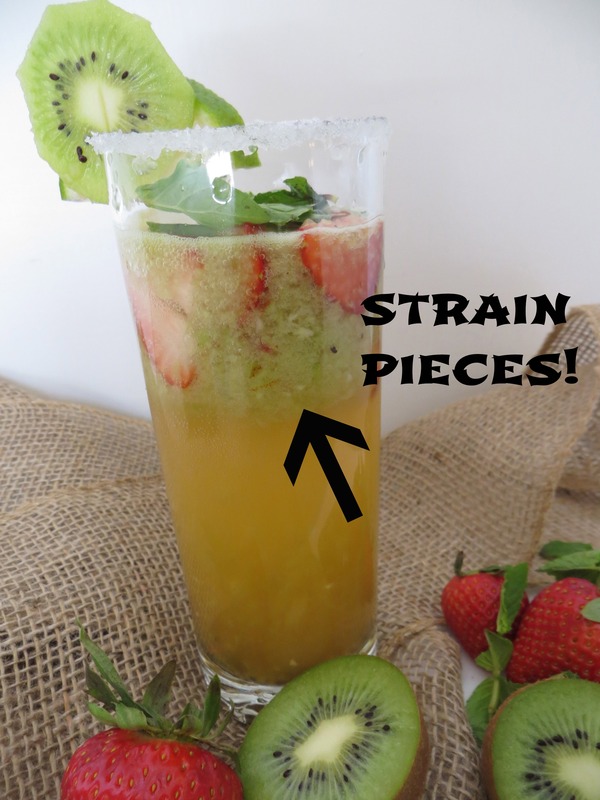 In a food processor, combine kiwis, 1/2 cup strawberries, water, and lime juice. Pulse until completely combined. 2. Set a sieve over a large bowl and pour mixture into sieve, press out all the liquid. 3. Pour reserved liquid into a serving pitcher. 4. Add rum , sugar, and sparkling water, stir to combine. 5. Add kiwi slices and a large handful of mint leaves. 6. Rim individual glasses with sugar. 7. Add a small bit of remaining strawberries to bottom of each cup. 8. Pour in rum/water/fruit mixture. 9. 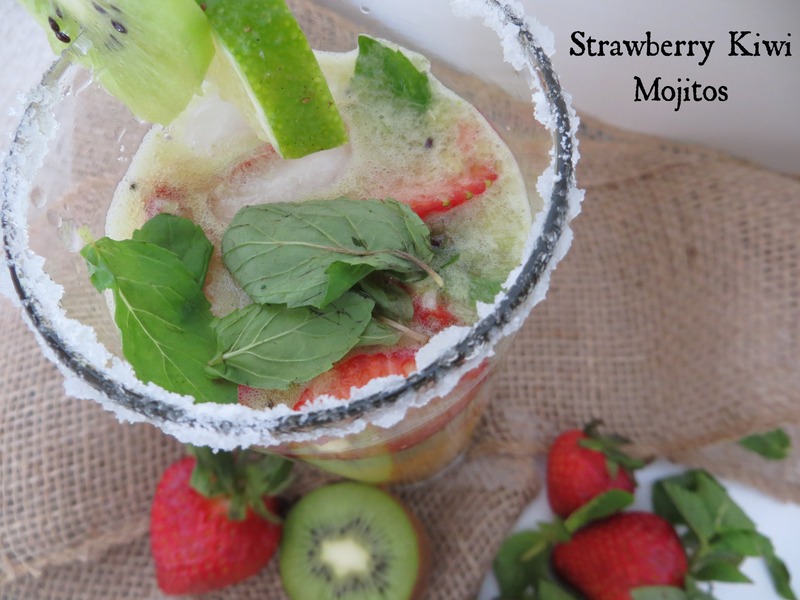 Add a few mint leaves and garnish with kiwi and lime. Be safe, enjoy a fancy drink and may the fastest horse win!